Review: Still spare and sensual, Gyun Hur’s work deepens in A System of Interiority, at Get This! Korean-born Atlanta artist Gyun Hur, whose solo show A System of Interiority is currently on view at Get This! Gallery (through March 1), finds success in her ability to hold both these qualities — the austere and abstract as well as the organically tactile — in abeyant tension. Such contradictions permeate the whole of Hur’s work, whose pared-down elements channel the likes of Walter De Maria, Carl Andre, James Turrell, Robert Smithson and the monkish Wolfgang Laib (yes, all men, but that’s a different review). But these formal references only probe skin-deep. A romantic poet with a minimalist’s toolbox, Hur operates within a subversively Zen framework, equally propelled by the churning of her own interior life as well as the need to schematize it within a web of neatly organized lines. Suspended within an assortment of simultaneous opposites — between seduction and resistance, between the definitive and the elusive, between things contained and things falling apart — Hur’s work signals a mind turning over on itself repeatedly. The results are layered and convoluted; pristine and balanced. Coming to prominence within the last five years, Hur, a 2011 Artadia awardee, is most known for her hand-shredded silk flower installations, such as those exhibited at Lenox Square mall (sponsored by Flux Projects), the Hudgens Center for the Arts, and Get This! Gallery, all in 2010. These works deliberately referenced Hur’s familial and cultural origins as a Korean American — specifically, the traditional Korean “wedding blanket” belonging to her mother — and also served as a vehicle for connecting to her parents, who were included in both works as collaborators. 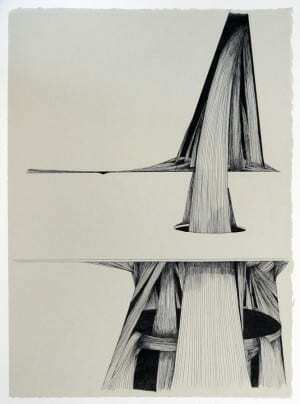 Here, Hur plunges a bit deeper, presenting us with the underworld of her earlier abstract landscape configurations. While formally similar to previous works (with compositions inspired by Japanese gardens of the Muromachi period), gone are the spirited rainbow cascades and sweeping beds of electric color. In their place is a dark hovel of sorts, equally polished as before, but with shards of existential ruin and decay budding from the surfaces. Hur has swept her ruin into neatly formed lines, telling us this work is not only about interiority but the regulating of its appearance as well. The installation exists in a large L shape in the corner of the gallery. As a semi-abstracted landscape, it exists as a hybrid of phenomena. At times it appears as a charred, war-torn landscape, bits of broken pottery replaying the shattering of antiquity and its ideals. 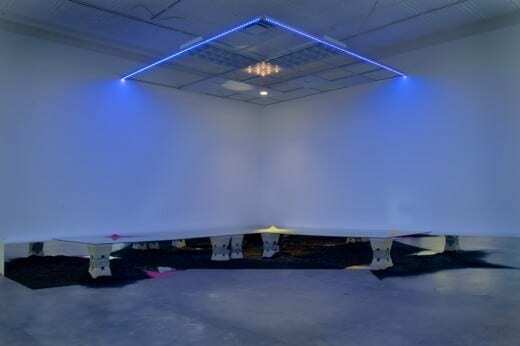 It also resembles something like a large Korean dinner table, and in a manner similar to Rashid Johnson’s domestic, Mondrian-esque wall hangings, creates the feeling that the gallery is actually someone’s home. Covering the floor in uneven mounds are black shredded silk flowers mixed with soil and sparkly black glitter. Every so often, reflective pools appear (which are actually mirrors), similar to Robert Smithson’s Displacements series. They reveal the underside of more shredded flowers (this time in neon pink, yellow and green) neatly deposited on the glass tabletop above. These simultaneous vantage points — both from above and from below — create the feeling of being underground. 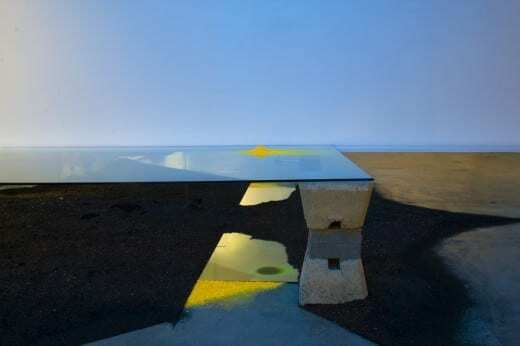 More mirrors frame the rear walls of the piece, implicating the viewer in Hur’s subterranean landscape as he or she crouches down to get a closer look. 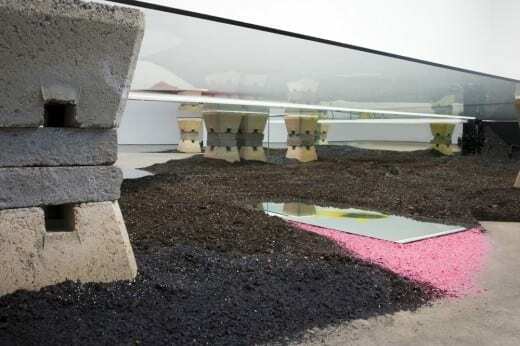 Whereas Hur’s former installations existed as color fields or generalized abstraction, the added human elements in her current work — namely, pottery and a single bouquet of black flowers — evoke a stronger feeling of human presence, or absence, as it were; the quiet ruins of Pompeii after the eruption of Mt. Vesuvius, perhaps. Gyun Hur: A Systematic Fall No. 1, 2013, pen and ink on paper, 15 x 11 inches. The series of four works on paper — A Systematic Fall nos. 1, 2 and 3; and Hole — offer a one-to-one private corollary to Hur’s larger installation. Very straightforward ink drawings on paper, they are extremely precise and evoke a similar dichotomy between natural fluidity and the hard edges of control. A System of Interiority is a work born out of themes of exposure, loss and rupture — topics within this context of “interiority” assumed to be largely personal. What is most compelling about it, however, is that the work evolved collaboratively. At first a counterintuitive premise, one is compelled to ask the question: what does it mean to probe one’s interior landscape collectively? Hur, arguably a collaborator by nature, worked with three art writers who are also close friends — Kristin Juarez, Lilly Lampe and Ruiyan Xu — all of whom engaged with the artist via e-mail in a series of conceptual ruminations and personal extrapolations on the themes of the work. Included (in rotation) on the gallery wall are text pieces written by the three writers exploring these ideas from their own vantage points. “As I know them and . . . their current waves of thoughts and experiences, I thought that we all had something similar going on. This sense of our own interiority being shifted, erupted, exposed . . . I thought this project would be a perfect opportunity to explore this with honesty,” Hur said in an e-mail correspondence. Hur also collaborated with artist and lighting designer Rebecca Makus, who cocreated the unusual lighting system with Hur, one that allows for viewers to alter the lighting that informs the work — anything from neon LED lights to warm house lighting to sterile office lighting. Depending on which constellation of switches you turn on or off (especially at night), the piece can go through any manner of moods. For a show that navigates the private terrain of the interior, one wonders what might be lost in the collective execution of a topic so seemingly individual. In an increasingly collaborative art world, the notion of an individual brewing ideas within a private, incubated, gestational process might seem passé to a newer generation of ever-connected, tech-savvy modernizers, for whom being an artist means plugging your fire-wire into a much larger mechanism of socialized art production. This certainly has its place and has produced remarkable works. But perhaps the goal of A System of Interiority is not to unearth the unsightly muck of the vulnerable, but instead to address “interiority” as something to be cracked open and shared. What makes Hur unusual for her generation is her appetite to probe both deeply and broadly, both inwardly and outwardly, igniting resonant connections with her collaborators in a manner that fuses lasting bonds. It’s not cheesy or annoyingly clever or so eager to be novel or unprecedented; instead, it’s thoughtfully born out of an interest in exchange, inviting others to join her in the life-affirming ritual of her own creative process.